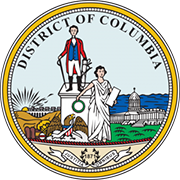 The corporation registry of the District of Columbia keeps record of all the business entities registered under the Secretary of State. The registry has information regarding Corporations, Limited Companies, Limited Liability Companies, Limited Partnerships and Limited Liability Partnerships. 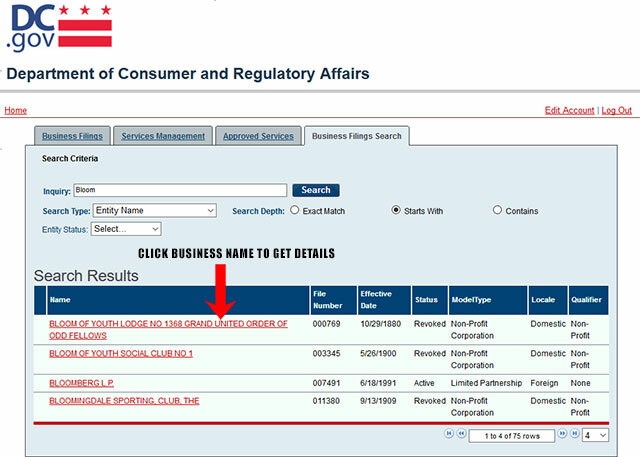 Below is a step by step guideline to use the District of Columbia business entity search tool. 1. 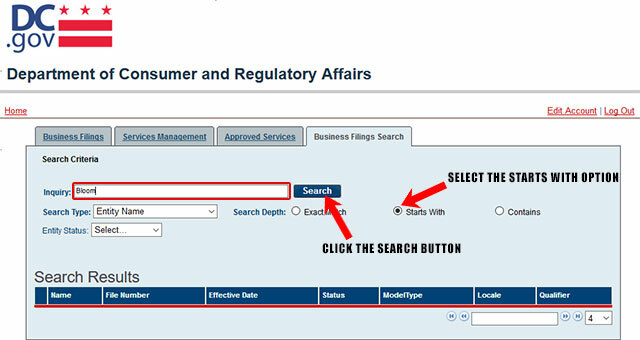 The first step to search for a business entity in the District of Columbia, you must create a free DCRA CorpOnline Web Portal account. It only takes a couple of minutes. To register your free account, click here. 2. Once you have created your free account, it will then send you to the main page. If it doesnt send you to the main page, then you will need to login with the account you just created by clicking here. Once logged in, you will see the main screen listed below. 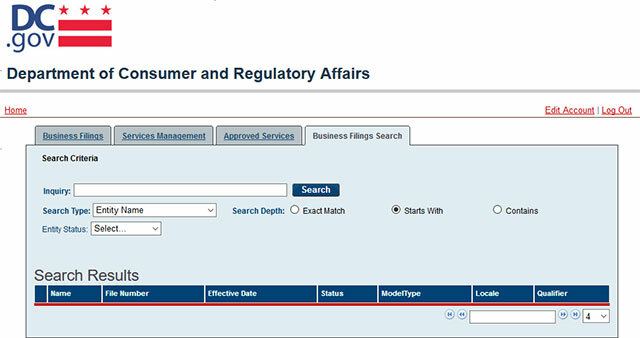 To start your business search, click the "Business Filings Search" tab. (The screenshot below shows the search page). 3. To test this out, we will search by Entity Name. 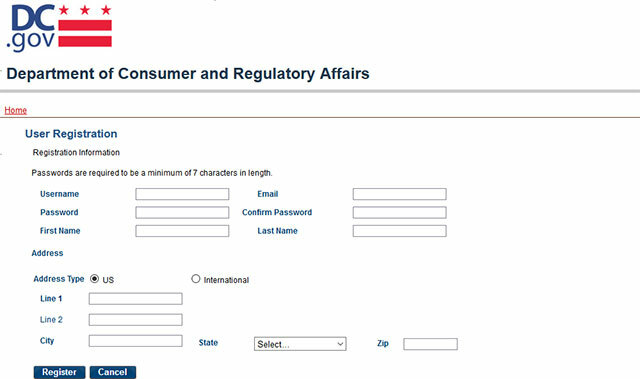 Type the business name "Bloom" in the "Inquery" field. If you want to, you can narrow down your search by choosing one of the radio buttons along with one of the options in the "Entity Status" drop down menu. For this example select "Starts With" and go ahead and leave the "Entity Status" drop down blank. Once you do this, click the "Search" button to search for this business entity. 4. A list of entities with or containing the name "Bloom" along with their File Number, Effective Date, Status, Model/Type, Locale, and Qualifier will then appear. If you want more information on entity, you can click on their name. Apart from accessing information, you can also file and download annual reports of a business entity, as well as register and renew licenses. 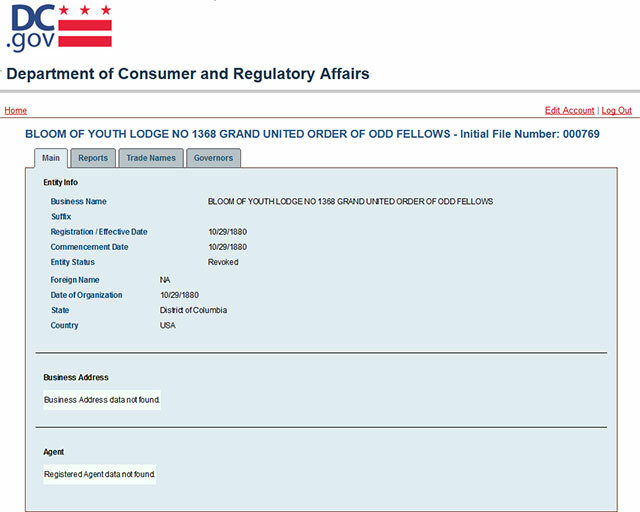 Below is a screenshot of the details for the business entity we clicked on. The Secretary of the District of Columbia is one of the highest government offices in the state and is responsible for a wide range of public services. The current Secretary is Lauren C. Vaughan.